Want to Learn French Without Crossing Oceans? Head to Canada! How about a little poutine with your French lessons? Heading to a country where French is spoken is one of the best ways to learn French. Not only do you get an immersive learning experience, you also get a taste of the culture. For many French learners, that taste might start with a sip of red wine along the banks of the Seine in Paris. But there are many other options for the traveling French student. In fact, you can get an exciting and high-quality French education (not to mention some of that tasty poutine) right in Canada! We’ll show you six diverse options available for all types and levels of French learners. What Makes Canada a Great Place to Learn French? Before singing the praises of Canada as a francophone destination, it’s worth mentioning why French has a presence there. Before the English, the French colonized much of what’s now Canada, founding the cities of Montreal and Quebec City, among others. New France existed from 1534 until 1763, when the English expelled them from Canada in the Seven Years’ War. After the departure of the French, the remaining French Canadians proudly held onto their language—a difficult task when surrounded by English speakers. Despite the odds, French Canadians discovered a cultural and linguistic pride during the 20th century and, thanks to linguistic laws and Canadian bilingualism, French in the French Canadian areas is alive and well. French-speaking Canada is generally a cheaper destination than France. Of course this depends on your lifestyle, but generally speaking, traveling through Canada is often less expensive than traveling through Europe. It’s simply a matter of resources. Canada is huge and produces a lot of what it needs. On top of that, Quebec and other French-speaking areas tend to have lower costs of living than provinces like British Columbia. Canada is much closer to home for many French learners. Tying into the above, if you’re from the U.S. (or English-speaking Canada), you can get to French-speaking Canada without a costly transatlantic plane ticket. Canada gives more opportunities to stay and learn French. Staying in France for an extended period generally requires family ties or a job offer for which nobody else in the EU qualifies. Canada, on the other hand, is an immigrant-receiving nation with straightforward and set rules. First of all, if you only want to visit as a tourist, Canada gives you six months while France only gives three. You can learn a lot of French in six months! Furthermore, if you speak French, you can immigrate to Canada as a Quebec Provincial Nominee provided you meet the other requirements. On a national level, speaking French gives you points in the Express Entry scheme. Finally, if you choose to study in Canada, you can stay and work for a while after graduation and receive Express Entry points for having a connection to Canada. Canada offers a wealth of French immersion programs for all levels. In Canada, learning French isn’t just a hobby—it’s a necessity for many public sector jobs. More and more, it’s becoming the language of opportunity in Canada. Accordingly, there are many quality French institutes scattered across Canada. Whether you’re in the eastern U.S. or western U.S., there’s a program waiting for you just across the border. Read on to check them out! Like any undertaking, you can’t just jump in blindly. Here’s what to know so you can plan your French Canadian explorations to suit your needs. Traveling alone will force you to speak French. If the purpose of your trip is immersion, it’s better to travel alone. When you travel with your friends, you’ll generally stay in an English-speaking bubble. Also, traveling alone will make it easier to make French-speaking friends and explore what you want. Canadian French accents are very different from European French. Canadian French has been separated from European French for almost 300 years. It goes without saying that the accents are very different. Those who learned European French are often surprised that they can’t understand Canadian accents (and vice versa). And this isn’t even taking into account the fact that Canadian French isn’t just one accent. Quebec alone has about 15 accents, and then there’s Acadian French, which is also unique. But just because Canadian French is different from European French doesn’t make it a “degraded” form of the language. It has a long history of development. In fact, some believe that Canadian French is actually closer to Old French than the French spoken in Europe today. And most will be happy to oblige. What’s more, many will appreciate your efforts. Do I need a visa to study French immersion in Canada? Generally speaking, if your stay is less than six months, you won’t need a visa if you come from the U.S. (among some other countries). Accordingly, most French immersion programs that aren’t full-fledged degree programs can be completed in under three months. It certainly is possible to complete a degree in French in Canada, but you’ll need a study permit. Want to make a little money while you study? Check out the SWAP program. Citizens of many countries can take working vacations in Canada and work while they study French. Unfortunately, the U.S. isn’t one of these countries. However, all’s not lost. The SWAP program provides a series of exchange opportunities up to six months in length open to U.S. citizens. For those of us who aren’t rich, this could be an invaluable lifeline while studying, not to mention a great way to immerse yourself in French. For adult learners, the ideal situation is an immersion trip, usually over the summer, anywhere from two weeks to three months. Canada offers many quality programs like this for adult learners through universities and private institutions. One of the most popular is the École Québec Monde, located in Quebec City, the heart of French Canada and the historical capital of New France. Choose from intensive French or individual French programs depending on your learning needs. École Québec Monde lets you choose the program you want based on your goals. Intensive French is great for those starting off and who want a run through of foundational grammar. Individual French is one-on-one work with a trained professor. Of course it’s more expensive, but the level of personal interaction can’t be beat. There’s also a combination program that allows both intensive group and one-on-one study. On day one you’ll have an evaluation so that you can learn French at a level appropriate for you. If your summer’s packed, there’s always an immersion program available for you throughout the year at École Québec Monde. Check out their calendar for open slots. Practice French in your off hours with your host family. A great feature of École Québec Monde is that they don’t put you in dorms, but instead with French-speaking host families with whom you can practice 24/7. From my personal experience, this is the best form of accommodation because you aren’t tempted to speak English as if you were in a dorm with other students. Although an English-speaking institution, McGill is one of Canada’s top universities, so you know you’ll get a quality education through the McGill French Immersion Summer Program. Learn French while exploring the cosmopolitan city of Montreal. If there’s one city that most embodies Canadian bilingualism, it’s Montreal. Here, west-end English speakers brush up with east-end French speakers in one of North America’s most historic cities. From shopping on René Lévesque Boulevard to exploring the fabulous Mont Royal, there’s always something to see and do. And penny pinchers will be glad to know that Montreal is generally not as expensive as other Canadian cities like Toronto or Vancouver. 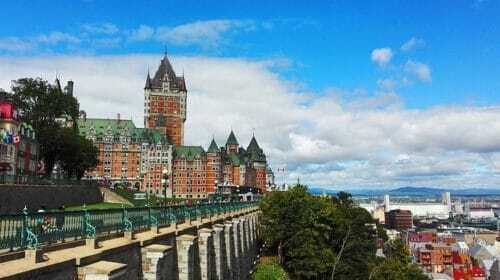 Frequent excursions will take you all over Quebec. The French Immersion Summer Program lets you sign up for trips to many great Quebec destinations like Quebec City or Mont-Tremblant. This is a great opportunity to get to know the province you’re studying in. Live with fellow students and make new friends. Unlike École Québec Monde, here you live in dorms with your fellow students. Although there’s the disadvantage of being tempted to speak English, you can make friends more easily this way. You also might enjoy being able to ask questions and discuss language roadblocks with other French learners whenever you need. In Montreal, McGill University is an English-speaking university, but the Université du Québec à Montréal (UQAM) is French-speaking. This might offer you a more complete immersion experience than McGill can offer. UQAM offers a variety of courses for all levels and price points. The UQAM Summer Immersion program leans heavily on college-level courses taught by professors. This is your opportunity to custom-make your own study program. Got French teaching goals? Take the French teacher training program. This program is popular with French teachers because it allows them to boost their language and professional skills over the summer. With French immersion schools increasing in popularity throughout the U.S., this could be the career booster you’re looking for. Take excursions to more “out of the way” Quebec destinations. What’s unique about this program is that it not only offers trips to renowned destinations like Mont-Tremblant, but also to the “true” Quebec, in out-of-the-way spots like Trois-Pistoles or Rivière-du-Loup. In these areas, you’ll hear a very distinct French from the accents spoken in Montreal or Quebec City and it may take some getting used to. Many people think that in Canada, French is only spoken in Quebec. Acadian French, the variety spoken in Canada’s Maritime provinces, is in fact a distinct accent that traces its roots as far back as Quebec French. The Université Sainte-Anne in Nova Scotia is a tried-and-true leader in French immersion programs, offering classes for more than 40 years. Programs are offered in one-, four- and five-week sessions to suit your schedule. Granted, these times are shorter than other programs on our list, but the curriculum is intense. You’ll get the dosage of French learning you want on your timetable. Furthermore, the one-week sessions are affordable for many people who can’t afford a full summer immersion program. While not attending classes, explore all that Canada’s amazing Maritime provinces have to offer. Although often overlooked by foreign tourists, the Maritimes offer breathtaking scenery and unique cultures. If you go exploring, you’ll find French-speaking enclaves scattered throughout the region. Have more time on your hands? Try the Integrated French Immersion Option. If you’re college hunting, the Université Sainte-Anne is considered a pioneering institution for offering degrees to anglophones with French as the medium of instruction. The only requirements are that you already speak B1 (intermediate) level French and that you sign a pledge to only use French 24/7. With a lower cost of living, Nova Scotia gives you more bang for your buck. Granted, most of Nova Scotia speaks English, but if you’re on a budget, the Université Sainte-Anne and other Maritime French immersion programs generally are a little less expensive. The Maritime provinces also have a lower cost of living than other regions of Canada. As Canada’s official bilingual province, you’ll always find someone to help you with French. New Brunswick is the only officially bilingual province in Canada, with French spoken roughly in the northern and eastern third of the province and English in the rest. Moncton also is about one-third French-speaking—a bilingual city in a bilingual province. If you’re just starting out, this is great because it means you’ll always be able to find someone to explain something to you in English if you get overwhelmed. Are you Canadian? You can participate with the Explore Bursary. The Université de Moncton participates in the Explore Bursary, which is a scholarship for Canadian students that lets them study one of Canada’s official languages, English or French, to the point of fluency. The Explore Bursary provides financing for a variety of programs. You can receive up to six university credits for participating. What makes the immersion program at the Université de Moncton unique is that your summer immersion can be used for college credit, depending on the length of your program. You’ll have to check with your university to see if the credits will transfer, however. Just because you’re on the west coast doesn’t mean you can’t learn French in the part of Canada nearest you. Like I mentioned, French-speaking communities in western Canada are small, but they do exist, as do immersion programs like the French Summer Institutes at the University of British Columbia. At about a thousand dollars for three weeks, this is a more affordable option. The tuition at the University of British Columbia is reasonable for the budget-minded, but be careful. Vancouver is one of the most expensive cities in Canada. What you save in tuition you can lose in cost of living. Choose the morning-only option to explore vibrant and multicultural Vancouver. The University of British Columbia offers morning and afternoon sessions. If you want to integrate your French learning into a Vancouver vacation, this is a great option. Vancouver is home to a large immigrant population, a teeming downtown and spectacular west coast scenery. Just be sure to bring an umbrella! UBC Summer Institutes are very popular with prospective teachers. Like the UQAM Summer Immersion program, the UBC Summer Institutes train budding French teachers, attracting French speakers from all over North America who want to pass on this beautiful language. French has been in Canada since its inception. Far from being an isolated dialect, Canadian French is healthy and diverse. As one of the nodes of native French speakers, the French-speaking regions of Canada will offer you the immersion experience you’re looking for.